We love to swim and to do it together is ever better. It is that adventure, achievement and confidence factor which motivate for more. Some young people cannot swim to begin with, may not even be comfortable in a swim suit but with encouragement and sense of fun the fear barrier can be overcome. Many do not have transport to swimming pools so the adventure in a mini bus adds to the event, not to mention the end of project treat at McDonalds. Our aim is to increase confidence during the winter months so that when we hit the beach we all have confidence to get into a wet suit and surf. This has actually happened and the excitement was bigger than the Atlantic waves! 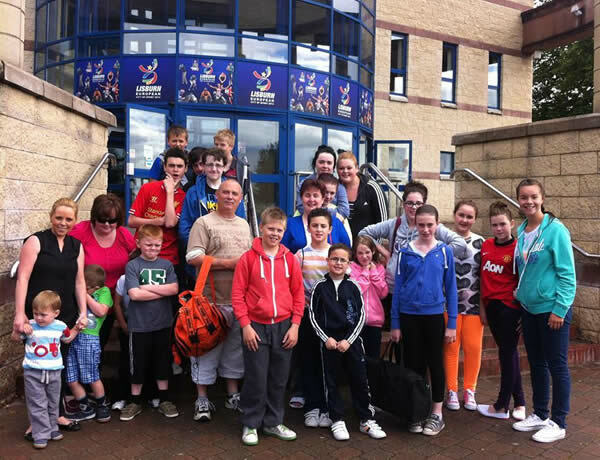 We organise regular trips for local people to go swimming at venues like Lagan Valley LeisurePlex in Lisburn. Please see the picture below of a recent group.